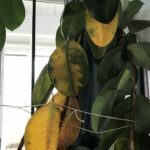 After probably overwatering my rubber tree, I started getting significant leaf drop--2 or 3 leaves would fall off each day! After not watering it for several days, the leaf drop has slowed down, but I did notice these little spots developing on the stems and shafts of the tree. I'm not sure if it's scale or some sort of fungus--from what I've read I don't think it's scale but I could be wrong. How do I treat this? I believe you are correct in assuming that it is fungal. And I believe that you are, also, correct in the diagnosis of over watering. This will have caused the fungal issue. If it has been some time since you started seeing symptoms, then this can be a very difficult problem to solve. These are quite drought tolerant, even though they do like slightly moist soil at all times. Overwatering will kill these pretty fast. The only thing I will recommend here is a solution of peroxide and water, and 1 part peroxide to 3 parts water. This will be the easiest way to attempt a correction at this point. Make sure there is plenty of drainage holes in the container, and remove any standing water. Let this dry out pretty well between watering, and you should start to notice new growth soon. BushDoctor, Thanks for your quick reply! Should I go ahead and water the plant using the peroxide and water solution, or should I make sure the plant dries out completely first? Would repotting it in new soil help too?